FertilityIQ: How Many Embryos to Transfer? When a patient has multiple embryos available, she must decide how many embryos to transfer for each transfer. The decision carries major implications for her health, the health of the offspring, the likelihood that transfer leads to a live birth, and yes, the family’s future finances. We’ll tackle each of these these in this chapter. According to the CDC, when a single embryo is transferred there is a 1% chance of a twin or multiple gestation birth. When multiple embryos are transferred, 27% of births are twins or multiple gestation. The risk that a multiple-embryo transfer leads to a multiple-gestation birth is higher for younger women (say, under age 35) than for older women (e.g. over age 38). Carrying multiple fetuses is dangerous as rates of infant mortality and cerebral palsy increase manifold to the mid-single digits per child. The risks of complications to the mother during delivery rise in a similarly alarming fashion. This is a well-characterized phenomenon based on large datasets. Multiple gestation births are born prematurely 57% of the time for twins and 96% of the time for triplets. This matters because the baby’s brain develops significantly in the last month of gestation, with a 50% increase in cortical grey matter forming in that stretch. Below is data from a meta-analysis of 12 of the better-run studies analyzing the association between prematurity and cognitive ability: each study clearly shows an undeniable association. Even when single babies (known as “singletons”) are born from IVF, their welfare can be closely associated with how many embryos were used in that transfer. If the mother transferred one embryo that singleton baby is less likely to be born prematurely than a singleton born from a multiple-embryo transfer. Below you can see results for eSET (elective single embryo transfer), and DET (double embryo transfer) segmented by whether a single, or multiple, heart beat(s) were detected. Your clinic may insist upon transferring embryos that have only been grown to Day 3, not to Day 5 or 6. Day 3 embryos are less developed, and generally speaking, have a lower-likelihood to lead to a live birth and thus multiple births. In 2017 ASRM revised its guidelines to cap the number of embryos a woman should receive per transfer. We’ll cover those guidelines in the next section but the nature of the embryos (Day 3 versus Day 5 or 6) as well as other factors (e.g. the woman’s age) figure prominently into the recommendations. However, ASRM does not ask all patients receive single-embryo transfer because in many cases multiple-embryo transfer has benefits. We’ll cover these in the next chapter. 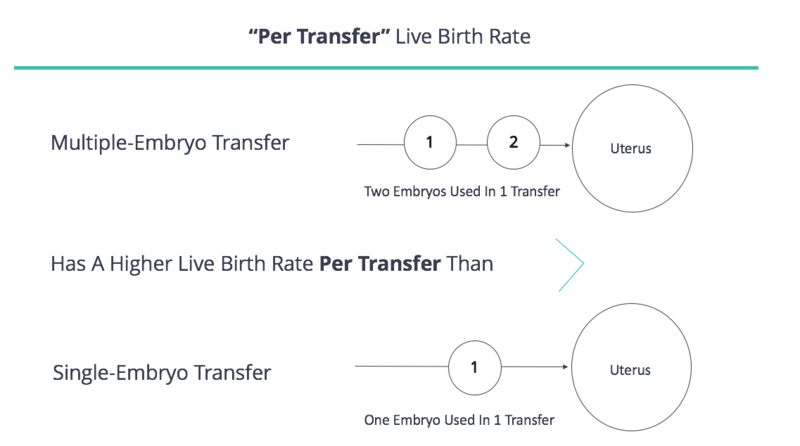 When describing how the decision of “single versus multiple-embryo transfer” impacts the likelihood of a live birth, we think it’s important to look at this on a “per transfer” and “per cycle” basis. 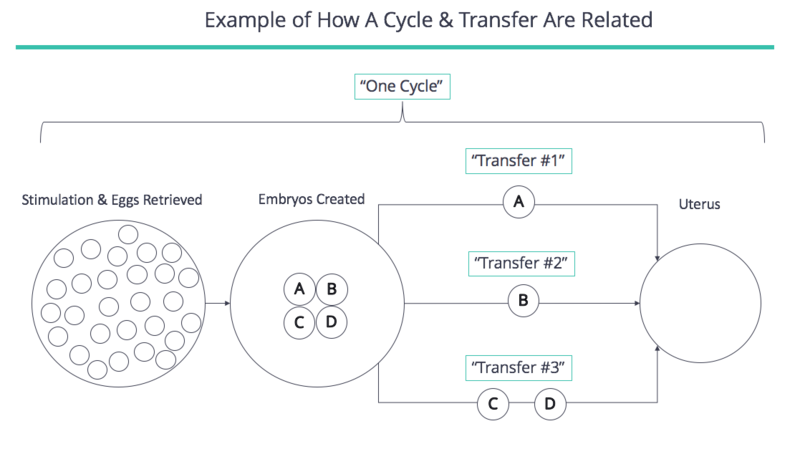 To clarify, when a woman has an embryo, or embryos, placed into her uterus that is known as a “transfer.” To create those embryos, the woman has her eggs retrieved and that begins a “cycle”: all of the transfers done using eggs (embryos) created from that cycle’s retrieval are considered part of that “cycle.” In the diagram below, three transfers took place, all belong to one cycle. When a patient elects to transfer multiple embryos in a transfer, there is a higher likelihood that transfer will lead to a live birth than if she has one embryo transferred. Thus, pursuing a “multiple embryo per transfer” strategy often reduces the number of transfers needed to have a live birth. This can shorten the time (often by a few months) and lower cost (often by a few thousand dollars) needed to have a child. 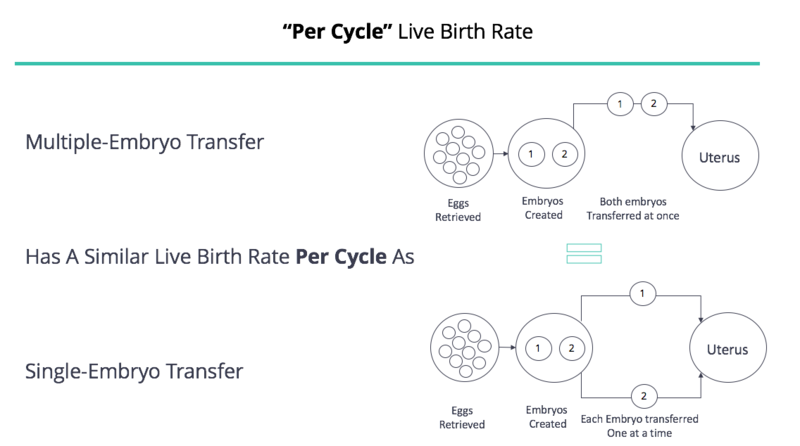 While it may take “single embryo per transfer” patients more transfers to achieve a live birth, when all of the embryos in a cycle are transferred, their live birth rates per cycle are likely no different. Thus neither approach reliably lowers the number of cycles needed to have a child. When women include more embryos in a transfer, the likelihood that transfer will work increases. This is true in most circumstances, and it’s especially true for women as they get older. Below you will see this in the CDC’s breakdown of 2013’s Live Birth Rate per transfer broken down by age. Another important caveat is that it appears when a single, PGS-approved embryo is transferred, the live birth rates per transfer are similar to that when two, non-PGS tested embryos are transferred. Importantly, this data comes from a single clinic and is based on a small number of patients (<200). It’s unclear if these results are in any way generalizable to other clinics or to a broader population of patients not seen at this clinic. All the same, the comparable Live Birth Rates are striking, especially in context of the lower twin rate and lower percentage of deliveries that end up in the NICU. Patients who elect to transfer a single embryo have additional embryos to transfer if the first transfer fails. When a team from Sweden in 2004 included births from those subsequent transfers, and compared them with the live birth rates from “multiple embryo per transfer” patients, they saw no statistically-significant difference in outcomes. And yes, the twin rate was far lower. There can be many interpretations of this data. Our interpretation is that when there is a finite number of available embryos (e.g. from a single cycle), transferring one embryo at a time, or multiple at a time, does not alter the live birth rate when all embryos are used. This leads us to believe “single” or “multiple” embryo strategies are largely equivalent on a per cycle basis. If we are indeed wrong, we believe it may be on account of a few factors. Patient Attrition: We assume patients in the “one embryo per transfer” camp return for another transfer after each failure. If they do not, good embryos may go unused and this limits that patient’s chances for a live birth from that cycle. Each subsequent transfers costs $3,000 and some patients run out of money, or conviction, in the IVF process. “Fail Faster”: If a patient has no viable embryos, transferring more embryos earlier will help the patient learn their fate faster. It may help the patient start a new retrieval cycle months earlier (especially helpful in older patients) and as a result that subsequent cycle may be more likely to succeed. Poor Data: Disappointingly the data on the subject is from trials conducted only in younger patients (under age 36 or 38) and using outdated laboratory technology. However, until we see updated data, this is the best information we have. Many single-embryo transfers fail and another question is whether on the next transfer one, or multiple, embryos should be transferred. Unfortunately there is little data on the subject and you should confer with your doctor if they have a strategy for this circumstance and the logic or data to support it. For myriad reasons, your clinic may insist upon transferring embryos that have only been grown to Day 3, not to Day 5 or 6. Day 3 embryos are less developed, and generally speaking, have a lower-likelihood to lead to a live birth and thus multiple births. The American Society of Reproductive Medicine (ASRM) believes transferring multiple Day 3 embryos is of lower risk from a multiple-birth perspective than transferring multiple Day 5 or 6 embryos. Thus, keep in mind the nature of the embryos you are transferring when determining how many to transfer. The American Society of Reproductive Medicine (ASRM) has guided to limiting the number of embryos a doctor should transfer in the context of the patient’s profile and maturity of her embryos. Should you, or your doctor, choose to exceed the suggested limit, we urge you to be clear with your reasoning and consider the additional medical risk (and financial risk, which we cover next) you are taking. Our goal here is to give you a high-level sense for the associated financial costs that accompany each choice. For some, this is unimportant in comparison to the medical trade-offs. Depending on a patient’s age, multiple embryo transfer likely saves her a transfer (or two) on the way to learning if any embryos will lead to a live birth. Each transfer costs about $3,000. Additionally, as we alluded to in the last section, transferring multiple embryos may unearth earlier if the cycle produced no viable embryos. This may allow the patient to start a new cycle at a younger age, and even a matter of months can improve that subsequent cycle’s odds of success. Each cycle costs between $15,000 and $25,000. On average we have seen multiple embryo transfer lead to 20 – 40x higher rates of multiple gestation pregnancies. Twin births often cost $100,000 in immediate medical expenses and triplet births are closer to $400,000. This excludes any downstream expenses (medical, educational) accrued after the age of 1. Thus, entities responsible for these costs (governments, employers) often request or require patients to have single-embryo transfers. 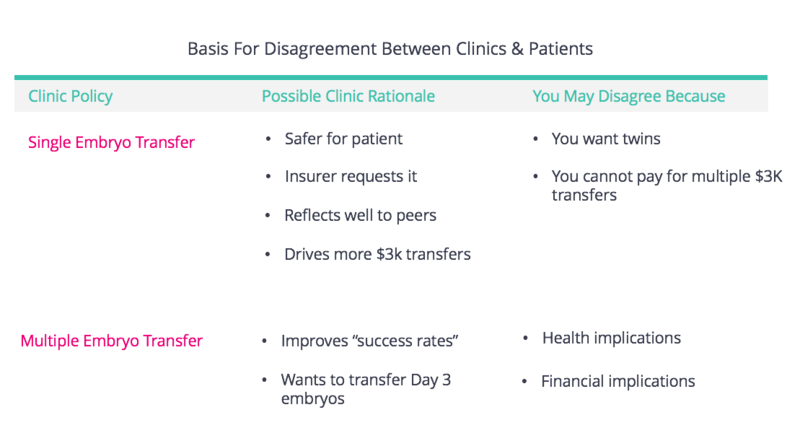 For instance, Kaiser (both a health provider and insurer) offers free single embryo transfers to incent patients to transfer one embryo at a time even it means more transfers. If you are responsible for more of your own health care costs (you are in a high-deductible plan, or you own your own business), these expenses may matter more to you. After delivery, the financial consequences for delivering a premature infant (or one with a condition like Cerebral Palsy) just begin. Below is a sample rundown of expenses that may impact the family on a go-forward basis. Also, we should note that if U.S. insurers are allowed to raise premiums based upon a person’s pre-existing conditions (e.g. cerebral palsy) the risks and costs for having a premature infant will rise. This is not factored in below. Ultimately, while multiple embryo transfer may confer a near-term savings, it has the potential to drive long term costs, some of which must be covered by you, some of which will be covered by your employer / insurer or the government. It’s common for doctors and patients to disagree on the number of embryos to transfer. Doctors and clinics often have strict policies and you must ascertain what your clinic, and will not, do. In nearly a fifth of all cases, the discussion happens only right before transfer. That is not nearly enough time for a patient to weigh their options and clearly not enough time to reconsider where they will be treated. Prepare yourself for the reality that your doctor holds a lot of power over this decision. In 70 - 80% of cases when the doctor makes a recommendation, that is the number of embryos that get transferred. If you disagree with your doctor and feel strongly about your preferences, you need to be prepared to “argue your case” or find another clinic. It is your job to ensure your doctor discusses all the salient issues (e.g. risks to offspring, rates of success) in making this decision. Be prepared for your doctor to only surface data that reinforces their opinion (e.g. older women hear less about the risks of multiple embryo transfer). 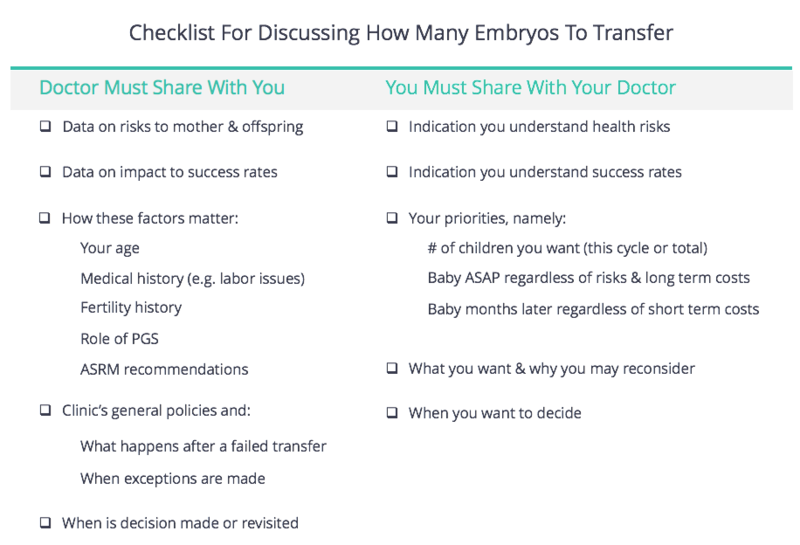 Discussions around embryo transfer can happen quickly and since there is a lot to consider, we recommend using this checklist to make sure you have fully covered the salient topics. Finally, be prepared for a different doctor to oversee your transfer (especially in large clinics and academic medical centers) and for that doctor to propose transferring a different number of embryos (or not to know the number you agreed upon with your doctor). We suggest coming to your embryo transfer with explicit direction for that doctor and have a signed recommendation from your primary doctor to bring to the transfer. Compare this approach to the ASRM guidelines and understand if (and why) your doctor wishes to exceed the recommended limit. If your doctor’s plan exceeds the guidelines, consider the medical and financial risks you are taking on. Once you agree on a plan, have your doctor put in writing what you have decided and why she or he supports the decision. Bring this to your transfer.